QPSK Modulation for CDMA, cdma modulation techniques QPSK in detail, Notes on CDMAA Modulation in depth, cdma service flow. If the modulation data changes, QPSK modulation makes one symbol change each period. If the data is the same, then QPSK and OQPSK do not change state. However, if the data changes, then OQPSK will make at least one symbol change and possibly two changes in a single period. 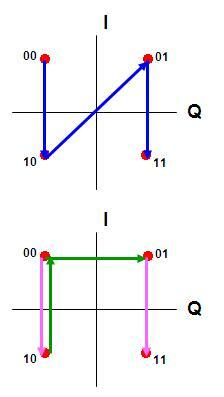 The upper I/Q diagram shows the symbol changes made by QPSK. The I/Q modulator for QPSK moves from state to state, for a total of three transitions (with one transition going through the origin). For the same pattern, OQPSK makes four transition, and it avoids the origin. The change from 00 to 10 results in a single transition since the value of Q did not change. However, the change from 10 to 01 makes two transitions because the value of Q does change. First the modulator returns to the 00 state. Then one-half period later, the modulator changes to the final 01 state. This action, due to the delay placed into the Q branch of the modulator, eliminates the transition through the origin. The change from the 01 to 11 state for OQPSK is a single transition since the value of Q again remained constant. 26 queries in 0.316 seconds.